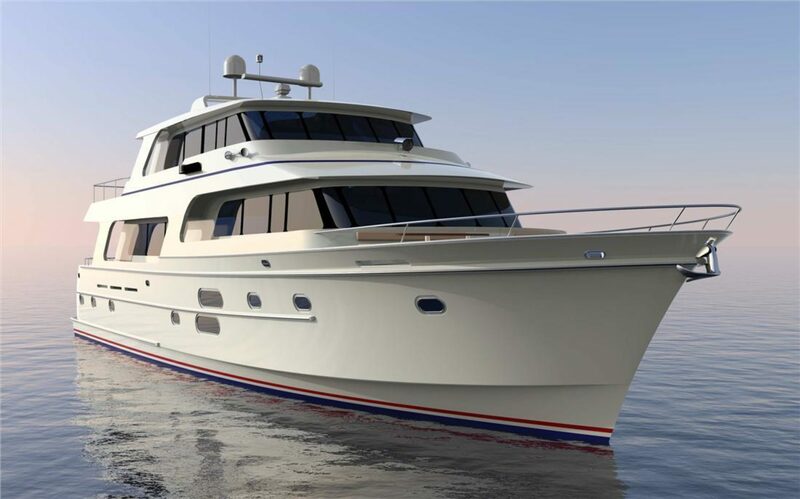 Hampton Yacht's passion for superior yacht design and construction will be put on dIsplay when the all new Endurance 870/920 Skylounge hits the waves. Built on the renowned Hampton Hybrid Hull, with accommodations that are second to none, she'll reward her new owner with many years of voyaging in comfort and style. 87' 7" / 92' 7"
86' 8" / 91' 8"
78' 1" / 83' 0"
Hampton Yacht’s commitment to superior yacht design, engineering and construction are embodied in the new Endurance E658 / E648 LRC Motor Yachts. Like all her sibling, she is built on the Hampton Hybrid Hull, renown for its efficiency and seakeeping. The Endurance E658 LRC comes with the addition of crew quarter accommodations. The design of the Hampton Endurance series represents a new, unique combination of safety, comfort, and efficiency in a serious cruising yacht. This is based on rigorous engineering as well as extensive experience. Few yachts in this size range embody both; though that may often be claimed or implied. The builder’s objectives for these craft included high efficiency across a range of speeds, combined with comfort and safety on long ocean passages. Cruise speed was to be 10-12 knots, with an efficient top speed of 18-20 knots; and a very long range at 9-10 knots. Naval Architect and Licensed Professional Engineer Howard Apollonio was engaged to develop the overall design of these vessels. He notes that it is hard to make a slow boat go fast; but much easier to make a fast boat go slow. The trick is to do so efficiently. The beginning of this solution was the design of the Hampton Hybrid Hull. Its roots go back to Apollonio’s development of split-chine hulls starting in 1977. With his specialty in hydrodynamics, he studied the shortcomings of conventional hulls with respect to wavemaking resistance. To overcome these, he divided the forward chine into upper and lower parts to reduce bow wave while retaining dynamic lift and spray control. The forward cross sections were made to resemble those of traditional round-bottom hulls to insure a smooth ride in waves. A combination of race boat and sailboat characteristics was employed to insure superior directional stability in following seas. Decades of successful versions of this hull form led to constant praise of Apollonio’s designs, large and small, fast and slow, including fine performance in severe sea states. The Hampton Hybrid Hull combines this experience with recent design changes to these hulls where the lower chine actually disappears in the forward of the hull. That also eliminates wave slap at rest. This, and changes to the upper chine, required very careful development to be successful. That was then proven in extensive model tank tests of this hull in rough and smooth water. The results confirmed the intended high efficiency in the targeted speed range, combined with exceptional seakeeping in very rough conditions, including sea state 4. The latter actually exceeded that of good 80-90 ft hulls in the same sea states at the same speeds. In the model tank test, significant (average of the 10% highest) vertical accelerations were low at 0.34 to 0.47g’s at speeds of 8 to 20 knots in sea state 4, with a 59 ft. boat length. The deck stayed dry in all cases. It should be noted that this hull overcomes the often-cited limitation of so-called “hull speed” at speed/length ratio (SLR) of 1.34. Its speed of 12-18 knots represents SLR = 1.57-2.35. This is in the pre-planning “hump” speed realm, which is a notoriously difficult regime to operate for most boats. And, this model has a displacement/length ratio around 240, which makes it far from a lightweight. Another part of this hull’s success is the careful proportioning of its basic hull form. The center of gravity and center of buoyancy at about 56% of waterline length sets the stage for fine waterlines forward and optimal stern fineness (while preventing squat). These, and the modest prismatic coefficient Cp=0.67, all match the criteria for efficient operation in the planned speed range. Carefully integrated propeller tunnels and a keel of modest depth provide protection without compromising shallow draft (around 5 feet). Onto and into this superior hull form is placed a spacious, comfortable interior. This benefited from Apollonio’s long, successful experience designing motoryachts large and small. Attractive, interesting public and private areas are tastefully and ergonomically arranged and proportioned. Rails and soft features enhance safe movement in rough conditions. 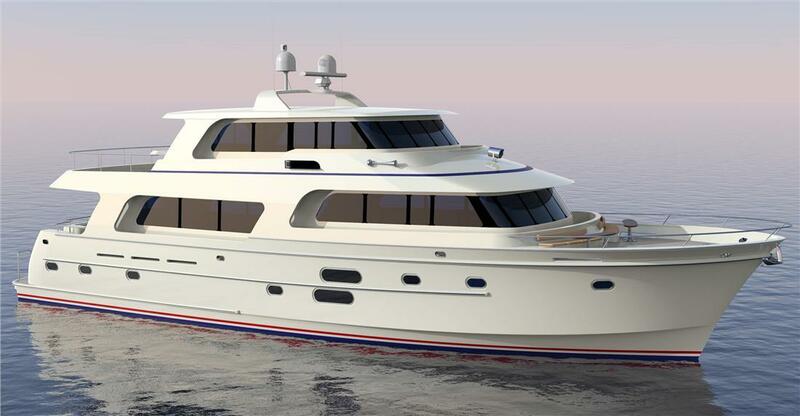 A combined social bridge and galley area make for a friendly pilothouse. The helm station can be isolated from the rest of the interior with curtains for night navigation. The partially separated salon provides a separate conversation area; yet is open enough for socializing with the galley and pilothouse. The large aft deck with built-in seating and table is an ideal location for fair weather gatherings. So too is the seating forward of the protective Portuguese bridge. An expansive flying bridge features abundant seating, storage, bar, and meal-prep areas, covered with a well-styled hardtop canopy. The lower level features a grand ensuite master stateroom with king size bed and several arrangement options. A queen bed ensuite VIP stateroom is forward. Between is a guest cabin that can have twin berths, or over-under berths and an ensuite head. Optional crew quarters are offered aft of the finely finished, ergonomically arranged, professional engine room. The optional skylounge version, opening up tremendous space and arrangement possibilities. Hampton’s renowned quality of construction and finish completes this picture, and insures lasting value. It was deemed essential that the foregoing attributes be packaged in such a way as to meet the highest stability criteria. The Hampton Endurance series was designed and evaluated to meet or exceed the Weather Criterion stability standard of the US Coast Guard for licensed passenger vessels in exposed waters service (Subchapter T, type S vessels, Subpart 170.170), proven for decades to insure passenger safety. Each and every Endurance LRC is, and has been, incline stability tested to determine the G.M. value for confirming compliance to above mentioned standard. Abundant initial stability, illustrated by high GMt values about 3.4 to 4.0 ft fully loaded, insure a solid, confidence-inspiring feel to the Endurance craft. At the same time, roll stiffness is kept to comfortable levels by tuning the roll period to a particular range of values. Historical and engineering research have shown that the ratio of natural roll period divided by waterline beam (Tn/B) should be about 0.25 - 0.27. Above that, boats feel increasingly rolly-poly. Below that, roll becomes increasingly stiff and quick. The Endurance vessels have Tn/B about 0.25 - 0.27, with a safe feel and long-term comfort. While the Hampton Endurance yachts are neither particularly light nor heavy, it should be noted that weight has little to do with comfort. A heavy boat may feel good a first, but will often roll a lot at sea, requiring stabilization for acceptable ride. Technically, for a particular vessel configuration, adding weight will reduce stability, unless it is added quite low in the boat. Hence, it is best to keep a boat light, within reason. A prominent shipyard long ago pointed out that the lightest versions of a standard series of passenger vessels also rode best in head and following seas, compared with their heavier counterparts. They did not have to plow through waves and take green water aboard; rather rode partly over waves, with acceptable motions. The other down-side of extra weight, as in most displacement hull craft, is that added weight always increases power required and fuel consumption at a given speed. Hence all boats should have weight kept to practical minimums. Practical includes cost and suitably rugged construction, as in the case of the Endurance series. In summary, the Hampton Endurance series of yachts embodies a fully-integrated set of vital features that function together synergistically. Comfort, safety, efficiency, solid quality construction, and fine finish are smoothly blended into a yacht that feels right and works right, for confident passagemaking and lasting value.